The film’s taut, insightful arc is a reminder of the lost power of restraint. Arriving considerably late in the fold of a genre sweep that insists on jump scares and soundtrack jolts, director Trey Edward Shults commits an audacious sin by, essentially, not revealing much to the audience. That suggests a great risk with the potential to unravel a narrative, although when modulated correctly can inspire a richness of tonal intensity. What separates this film from the conventional, perhaps, is that the director desires nothing of payoff or buildup and seeks only to erode the defense mechanisms we carry into horror films. And once it becomes clear that a very frightening ending awaits many of the key players, a basic security has long been eroded by an underlying desperation. If the most curious irony is how such a calm narrative can possess the fuel to drive such an ambitiously sly climax, it only goes to emphasize the need of movies like this where masses have openly lost the expectation of them. Unfortunately, that also inspires a dichotomy of consensus. When the movie first opened wide over the summer, most critics granted high praise to what they were seeing while moviegoers sneered resentfully at the result. Their disappointment was easily foreseen – arriving after an advertising campaign that suggested great dramatic intensity, many left displeased by that a mere movie could promise so much while remaining so frustratingly vague. But it’s within that blur of details, I feel, that a more patient observer begins to see the fundamental mechanics of the genre. Beyond every shadow, under the breaths of characters agonizing to hold back their words, is a doubt that clouds the assessment of reality. When one does not know the dangers they face, the mind populates rather unnerving answers. If “It Comes at Night” does not arrive at the conclusion that many hope for, it’s hardly out of spite – this is a filmmaker who has educated himself in the great lessons of Hitchcock and Argento, who understood that the tension of the unknown was far more frightening than the realities they could conjure. The characters certainly have ideas of what they face, but never completely confront them. Paul (Joel Edgerton) is the husband of Sarah (Carmen Ejogo) and the father of Travis (Kelvin Harrison, Jr.) – they have walled themselves up in a small rickety old house out in the wilderness that looks as if it might have been build decades prior, with no electricity and only board games to entertain them. The dialogue they exchange is a formality, to be emphasized by successive shots of their insensible gazes. Only in a very sad early scene do we get a sense of their predicament; Sarah’s father is seen in the final throes of what looks like a devastating plague, and both Will and Travis are seen wheeling him outdoors, where they shoot him and then burn his body. Is it indicative of an epidemic, or something more? A conventional film would sensationalize the event, but Shults remains startlingly distant from the impulse. That night he ambushes his characters with something else: a strange noise by the red door, which turns out to be a man seeking help from places unknown. That’s the story he tells, although Paul, perhaps rightfully, is deeply suspicious. Over the course of the next day the family sits quietly, nearly dead-eyed, while Will (Christopher Abbot) bellows with fright as he is blindfolded and tied to a tree. The audience, understanding the implications of the title, anticipates an event of great horror when the pleas carry over into the dead of night. Nothing ever comes for him, nor does he get sick. Then the next day both men exchange a tense dialogue, in which Will says he is seeking clean water for his wife and son, who are secluded somewhere on the other side of the forest. A bargain is suggested: if Paul will transport Will back to rescue his family, they will exchange food provisions and assist with chores. Little trust exists between them, but that becomes mandatory -- their relationship is incised from a primal need to survive something dangerous in the distance, emphasized further by an ambush in the woods that seems to happen entirely without motive or expectation. For a good while, that violent shootout feels like a precursor to more scares trickling under the surface. Yet the movie remains startlingly, frustratingly opaque when one expects it to leap off the rails. Six survivors work through a day-to-day routine like robots in assembly. Laughs are exchanged, commonalities are discovered. There are brief fleeting moments where the threats beyond the trees seem distant, almost lost in the haze. Young Travis, increasingly in the throes of pubescent lust, begins to develop a sense of his own sexuality; while in the company of Will’s wife Kim (Riley Keough) they interact with a certain innocent tension, and his smirk suggests more than playful banter. Only when the family dog chases after a strange noise in the distance are we reminded that greater threats loom, and when he comes home fatally wounded, it reaffirms the film’s impenetrable anchor – that the distant world has become a danger that defies description or reasoning. I have theories about what may be transpiring outside their sphere of isolation, as do any number of viewers reading between the lines. 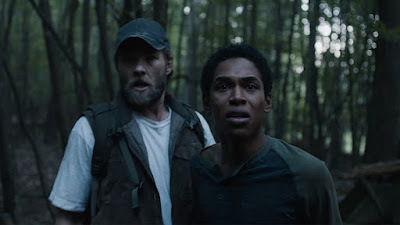 But “It Comes at Night” has far more sublime motives than leading us down a road of sensational reveals and shocking twists. 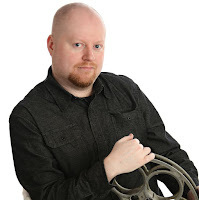 Think of what that does for the characters – because they are liberated from the possibility of being tools in an overwrought visual circus, we begin to see them not as objects but as individuals with identifiable behaviors. Their predicament becomes our own. There is a tense scene towards the end of the first hour that would not have worked in most horror films, but finds a startling foothold in this approach. The six sit down to a dinner and there is a discussion about the events of the previous night, in which the family dog arrived home near-death. Though one of the characters was the first to discover him by the red door, he does not turn out to be the one who actually opened it. Who did? Was it Will’s young son, who may sleepwalk? Or was it one of the other visitors? Paul’s skepticism is already amplified by inconsistencies in Will’s story – is this simply another nail in the coffin of trust? All the hushed observations and cautious decisions play right into the effect of the climax, in a moment so unforeseen that I was left temporarily speechless. Possibilities point to that outcome – the most obvious foreshadowing cues are dream sequences that seem to blur the certainty of a single reality – but never in my wildest imagination did I expect the film to go so far with its hopeless implication. Skeptics have dismissed the moment as a last-ditch exercise to salvage the commitment of mislead viewers, but I am of a more forgiving mind. Is that because the resolution exemplifies the movie’s overreaching message? Is that because it is as fearless as it is shameless? Is that because the director, going for broke, has provided his characters an outcome that matches their attitudes? Or is that because the real horrors are internalized in a far more lasting way? In some way all these things work to its benefit. “It Comes at Night” may not be your run-of-the-mill descent into the gutter of visual excess, but during those 91 minutes I found myself deeply shaken.